The Han Solo Spinoff Finally Has A Title! The young Han Solo spinoff. The untitled Han Solo movie. Han Solo: A Star Wars Story. We've been forced to call Ron Howard's upcoming Star Wars movie a bunch of really lame placeholder titles. Today that ends, just as production on the film has wrapped. Howard has revealed the title is...wait for it....Solo: A Star Wars Story. Eh. But what were we expecting? Han Solo: The Rogue Gambit!? Solo: The Empire Strikes Best!? Of course it was going to be bland and forgettable. As long as the movie is awesome, it doesn't really matter. Everything we've seen from the set has teased many of the highlights of Solo's early adventures, including the infamous Kessel Run. 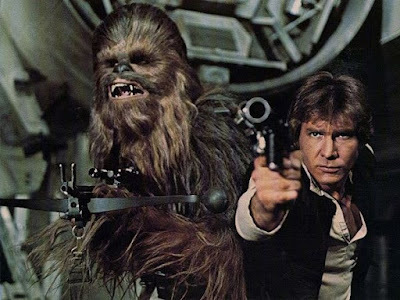 The film stars Alden Ehrenreich as Han Solo, in a performance that will be divisive no matter how good he is; Donald Glover as Lando Calrissian, Joonas Suotamo as Chewie, plus Woody Harrelson, Emilia Clarke, Phoebe Waller-Bridge, Thandie Newton, Paul Bettany, and more.